'Tis the Time for "'Twas the Night Before Christmas"
West Windsor, N.J.- The stage is set for the joyful visit by Jolly Old St. Nick. The Kelsey Players present their beloved musical adaptation of Clement Moore's "'Twas the Night Before Christmas" at Mercer County Community College's Kelsey Theatre. Performances take place Friday, Dec. 10 at 7:30 p.m.; Saturday, Dec. 11 at 11 a.m., 2 p.m. and 4 p.m.; and Sunday, Dec. 12 at 2 and 4 p.m. Kelsey Theatre is located on the college's West Windsor campus at 1200 Old Trenton Road. The celebration of the season begins with caroling before the show in the lobby. Patrons are invited to bring an unwrapped new toy for the U.S. Marine Corps Toys for Tots drive. A collection box is located in the theatre lobby. Once the curtain goes up, audience members will step into Clement Moore's imagination as his vivid poem of Santa's Christmas Eve visit comes to life for all. 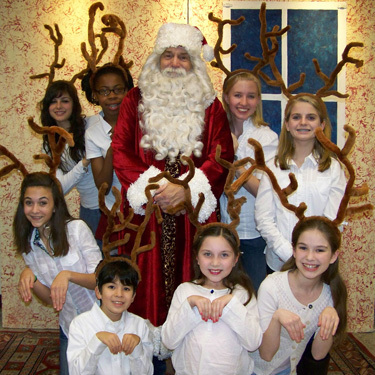 The entire family is invited to meet Santa and the rest of the gang at the end of each show. Delighting audiences will be cast members Steve Anzuini of East Windsor as Clement Moore; Marissa Marciano of Plainsboro as Charity Moore; Susan Hoffman of Robbinsville as Eliza Moore; Hannah Sobolevitch of Yardley, Pa., as Margaret Moore; and John Costello of Hamilton Square as Mr. Kringle. The ensemble includes: Maryrose Brendel of Cranbury, Nicholas Kianka of Hamilton Square, Olivia Michalak of Lawrenceville, Kiernan Matts of Hamilton, Alexys Pulsinelli, Uvay Trivedi of Columbus, Jana Graham of Jackson, Yakenya Moise of Ewing, Margaret DeLucia of Robbinsville, Claire Norden of Newtown, Pa., Isaiah Nitka of Columbus, William Burke of Lawrenceville, Courtney Haines of Lawrenceville, Hayden Clark of Lawrenceville, John Burke of Lawrenceville, Simon Hamilton of Princeton, Dakota Torres of Bordentown, Madeline Wasson of Cranbury, Alexa Lupinacci of Hamilton, Dottie Farina of Hamilton, Julia Vardakis of Robbinsville, and Jenna Venturi of Plainsboro. The production is directed by Tom Bessellieu, with musical direction by Pat Masterson, and choreography by Nicole Farina Machin. Tickets are $10 for adults and $8 for seniors and children. Free parking is available next to the theater. Tickets may be purchased online or by calling the Kelsey Box Office at 609-570-3333. Kelsey Theatre is wheelchair accessible. For a complete listing of adult and children's events, visit the Kelsey website. 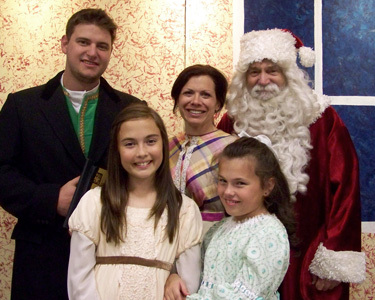 Pictured with Mr. Kringle are, clockwise from top left, Steven Anzuini as Clement Moore, Susan Hoffman as wife Eliza, Marissa Marciano as Charity, and Hannah Sobolevitch as Margaret. Simon Hamilton, Alexys Pulsinelli and Claire Norden.